The first challenge in establishing a proper QA routine is picking who will perform the quality assurance reviews. If mistakes were easy to notice in our own work, we would just fix them ourselves. Since that’s not easy to do, it’s best to have a pair of fresh eyes checking the project. If your company has enough capacity, the best option is to hire a QA specialist. Naturally, they won’t have the problem of being so involved in the project that they overlook issues. Moreover, a specialist will typically become faster and better at their task than someone who just reviews for errors occasionally. But if you’re a small agency, hiring a QA specialist is not always possible. Our own company only created the role in the past year, as we transitioned from two dozen to over 50 employees. You can still keep the principle of “fresh eyes” in a smaller organization by having developers or team leaders check other developers’ work. What about if you are freelancing? In this case, the most effective solution is to build in a couple of days into your timeline that you can put a project aside before a review. Work on something else for a little while. Then, when you come back, you will have a more objective eye for the work. Checklists save lives, literally. Hospitals and airlines are examples of areas where checklists have proved absolutely indispensable. Obviously, the stakes are not life or death when it comes to websites. But the principle is still the same: checklists work because humans are not good at remembering a long list of tasks with 100% accuracy. How you write your checklist depends on what kind of work you do. 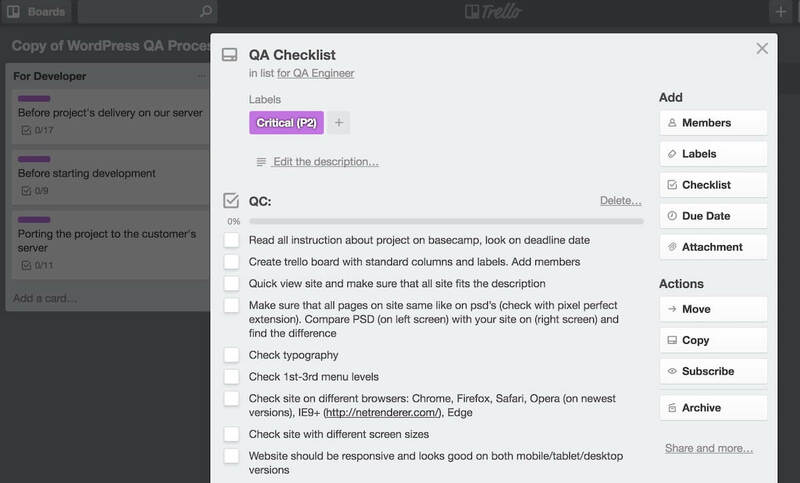 If your projects are relatively standardized, like building websites, it will be useful to make a QA checklist template. This template should cover the elements that should be reviewed for correctness for every project. If you work on software development, most projects may have common elements but also some aspects that are unique to each one. You can still start with a template, but to account for the unique features it may be useful to write up additional items to check based on the project description, before starting development. Now you have the basic ingredients: your quality assurance reviewer and a checklist of issues to look out for. How you put them together and build your workflow is key. Centralizing the checklists and additional tasks to be done so they are visible in one place. See again: humans being bad at remembering long lists of tasks. Distinguishing who has responsibility for moving the project to the next stage. This keeps the project on track when everyone is juggling multiple projects at once. We use Trello in combination with Usersnap to do this. We start with a template in Trello, where lists indicate who is in charge of a particular stage of the workflow. We use one board for the internal QA process, which only involves the developer and the QA specialist. We use a second board to process the external feedback from the client. This board incorporates the account manager and the client themselves in addition to the QA specialist and developer. The templates also have standardized checklists built-in for all participants as needed. This setup can easily be adapted given the individuals you choose to include as part of your process. As the QA specialist goes through their list, they add cards as needed to the developer’s list to indicate issues to be addressed. The Trello integration with Usersnap makes this process even simpler by directly adding cards to Trello when the reviewer gives feedback. It also includes additional useful information for the developer, like what browser and type of device is being used. Whether you use Trello or another task manager, this combination of visually tracking who should be working through their part of the process and exactly what they have done will let you scale up and still keep errors down. We’ve talked about how to set up a QA workflow so you can minimize errors in projects before delivering them to clients for external feedback. But what can be done to decrease the number of bugs that get to the internal QA stage, much less to the client? Sometimes (though not always) there are patterns of issues that pop up. To identify these patterns, you need to collect metrics. This could involve assigning the QA specialist in your organization to categorize the types of issues that come up as they are identified. Such information can then be aggregated about a given developer to provide continuous feedback for improvement. There’s a big caveat about collecting comprehensive metrics like this: on a small scale, it’s often not worth it. For example, even with several dozen employees, in our company, we are only just beginning to discuss future implementation of metrics on the feedback and QA process. Even so, our initial plans will be to give a general metric on quality, by tracking whether client feedback identifies bugs or additional “out of scope” requests, rather than giving detailed analyses of patterns of issues. The above are concrete steps you can take build an effective quality assurance process, which starts from recognizing how mistakes creep into the process. What tools or systems does your team use to optimize the quality assurance process? Share your tips with us in the comments! Bobby King is the Chief Operations Officer of The White Label Agency. He has managed the production of 2500+ websites over the past 3 years. The White Label Agency is a B2B partner helping marketing agencies, web agencies, and digital agencies build custom WordPress websites for their clients. Our partners create the designs, and we do the coding as their invisible back office.